Hp choose us like official web reseller. This is a guarantee for. 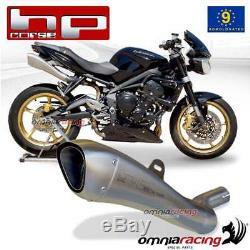 Hpcorse hydroform exhaust slip-on stainless steel satin homologated triumph street triple 2007> 2012. The kit includes the link-pipe (where necessary) The exhaust is developed with the original ecu, so the assembly does not require the remapping of the same, or the assembly of additional ecu's. Hp corse hydroform stainless steel satin cod. 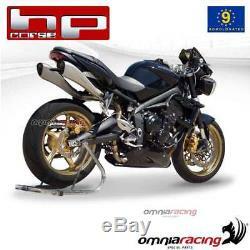 Pair of exhaust hydroform homologated direttiva 97/24 / ce-2006/120 / ce cap. Sound charm and power to a higher level. Hydroform is the name of the new line of Corsican heath. A terminal to go beyond every rule, where only the imagination could have pushed. Hydroforming is an extremely refined technology, which consists in the deformation of pipes through a high pressure water jet which allows the shaping of the tubes inside a forming mold. Thanks to this, a pipe is also obtained in the curves, avoiding the possibility of a change in the volume of the exhaust pipe, thus facilitating the flow of exhaust gases along the duct. The result is a light exhaustion, but at the same time. The slip-on of the hydroform line is the most beautiful sports in production. Hp corse, company based in bologna begins its partnership with steelform udine company for the production of motorcycle terminals. In 2009 the hydroform project comes to life, on design and development by the laboratories hp corse and metal processing by steel company specialized in processing and deformation of metals. Hp corsica it will remain the nerve center in the design of each component, steelform's task will be translated to french, perfect slip-on and special link pipe, perfect in design and style, totally made in italy. From July 2015 the 2 companies have expanded the range with evoxtreme and hydrotre (totally designed for mv agusta). Hp racing and steelform nowhere in the footsteps of a world of success in the world of pure development. Enclosure: special stainless steel with variable thickness 0.5 / 0.8 mm. Surface finishes: satin and black ceramic. Sound-absorbing material with high sound absorption capacity. Removable dbk with additional sound absorption chamber. 1 increased on request diameter not approved for use in closed circuit. 2 increased on request diameter 40 not approved for use in closed circuit. Stainless steel rivets in watertight. Logo engraved with the laser beam. Weight 990 gr (without dbk and fitting). In 1994, the passion and experience of manufacturing bertollini created omnia racing, with the aim of representing a reference point for everyone fond of bikes. In 2000, when salvatore orefice joins omnia racing, the company is founded, a society based on the passion and competence needed to create and trade the top products for motorbikes. Our continuous search for perfection and performance, using advanced technologies, has allowed us to interact with internationally recognized pilots and teams. Our products are excellent for both road and circuit use. They are continually tested by our technicians and pilots, thus improving the dynamics, dynamics and structural features of the materials adopted. The experience gained through the years of the competition has been greatly improved. Accostato, afam, aim, akrapovic, andreani, arrow, bazzaz, bc battery controller, bitubo, bmc, braking, brembo, bst, capit, castrol, derry moto, tuning fork, did, discacciati, eibach, ek, fabbri, far, frentubo , galfer, gbracing, giannelli, gifrap, givi, gopro hero, gpt, h2o, hagon, ixil, jollymoto, kappa, laser, lcr saddle, leovince, lightech, mafra, marchesini, marvic, marzocchi, matris, mivv, mra, nissin , ohlins, pbr, polini, pt, rizoma, rme, robby moto, sachs, stm, stomp, superb, suter, termignoni, valtermoto. Omnia racing is one of several important events: padova expo bike, national and international races, free circuit sessions. On the web, we are always associated with a direct contact with the customers, so we suggest the product that best suits their needs. This should allow our customers to feel at ease. All this has not been a decade ago, a reference point in italy; in addition, our products are still in demand in Europe and in the United States. The item "hydroform hp Corsican exhaust pipe approved triumph street triple 20072012" is on sale since Friday, July 13, 2018. 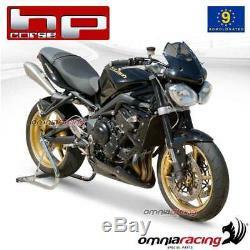 The seller is "omnia-racing" and is located at / in it. This item can be delivered anywhere in the world.